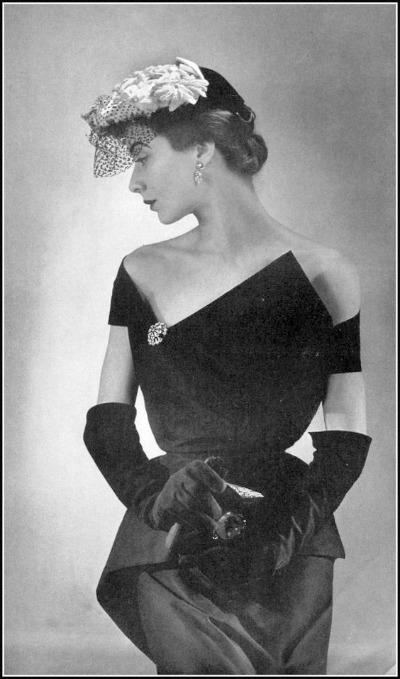 This stunning cocktail dress was designed by the French couturier, Jeanne Lafaurie. Equally fascinating is the black straw hat adorned with yellow flowers and a short voilette designed by Paulette. I had to check the definition of voilette. It is French for veil. The photograph is a 1951 Georges Saad. If you are so fortunate as to own a hat by Paulette, you must consider displaying it on a Marge Crunkleton mannequin. Considered one of the leaders in vintage mannequin head reproductions, Marge hand paints each of them era appropriately. You can view her inventory at Crunkleton.com. I am leaning toward #17 Paula. Which one do you want?